We are awoken by an early morning hotel wake-up call; it is 6:30 am! We struggle to get out of bed; we are all still tired from our exciting day yesterday! We try to hustle to get ready, but aren’t able to leave the hotel until about 7:05 AM. We arrive at the Consul General’s house at about 7:45 AM, and retrieve the solar car from storage there. We have another very nice conversation with the CG, David Fransen. He is a wonderful and interesting man and we all are really impressed with him. Mr. Fransen offers Marcelo a safe place to park the car almost every night that he is in LA, a real benefit for Marcelo. It is really great to be able to have a secure place to store the car at night, it helps Marcelo sleep better! Thank you very much, Mr. Fransen! Marcelo drives the solar car into the street in front of the van so Mr. Fransen can go to his appointment. We plot a course for Redondo Beach that is the safest for the solar car to take. Marcelo has 2 events scheduled there today. His good friend, Rob Stoyan is a flight attendant and has invited pilots, flight attendants and other airplane personnel to come and meet Marcelo and see his fabulous solar car. This is important to Marcelo as he is a flight attendant and has received a lot of help and support from his friends and other people who are in the airline or aviation industry. They were very early supporters for Marcelo and have helped him achieve his dream. 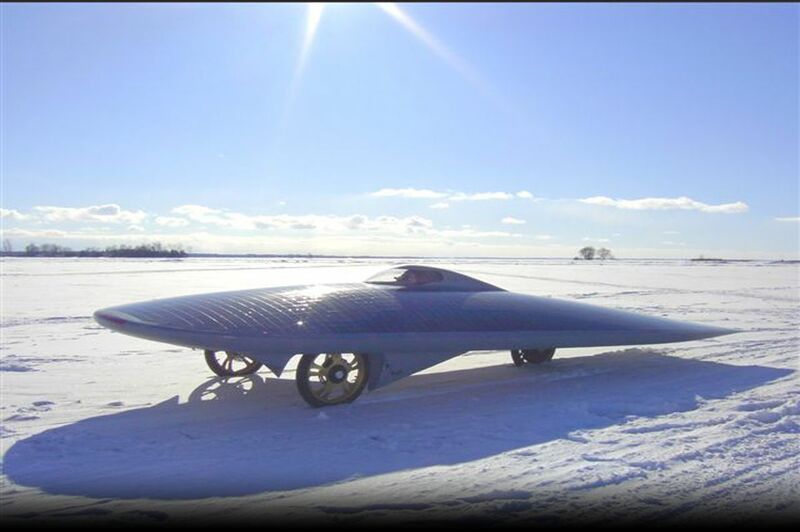 We also have a photo shoot with a beautiful model and the solar car scheduled today. When we arrive at Redondo Beach, two very distinguished pilots visit the solar car and allow us to take a lot of pictures with them with the car. We have some small and some large flight attendant/pilot groups visit the solar car throughout the day and get some good pictures of them. At about 11:30 AM, Marcelo drives the car in front of Ruby’s Diner for a photo shoot with a beautiful model. Her name is Jay Anne and she arrives with our new photographer friend, Jena. Jena takes many, many pictures of Jay Anne, Marcelo and various other people (pilots, flight attendants, waitresses, etc.) with the solar car throughout the day, probably at least 750 photos. Marcelo gets some gel put in his hair; he is a real celebrity now! He gets to ham it up a little. We are all anxious to see these professional pictures. The waitresses from the restaurant all come out to have their pictures taken with the solar car as well. We promise to have the pictures sent to them for publicity for the diner, in return, we get a free lunch there. We all have a milkshake with lunch, yum! Thanks so much, Ruby’s Diner! The model goes to change outfits while we are eating lunch. Jena decides to take the solar car and the model, Jay Anne up the Redondo Beach boardwalk for some more photo opportunities. We all get to accompany them by riding on a small cart driven by a Marina employee, Tom. (?NAME?) Marcelo is going to drive the solar car behind the cart while Jena and the rest of us ride on the cart, or walk with the solar car. This is one of the most interesting and fun things I have ever done, Jena and I get the best view of the solar car as it drives up the boardwalk, as we are on the very back of the cart. She and I take lots and lots of pictures! It is so exciting to see the reactions of the people who are shopping, walking, eating and/or drinking along the boardwalk as Marcelo drives up it! So many of them are tourists that a lot of pictures are taken this day and a lot of cheers are heard, too! I can’t wait to view the photos from today, it was so much fun! It was overheard that someone speculated that the solar car was being operated by remote control, much to the whole team’s amusement! I guess even with the new window, some people still can’t see you when you are driving the solar car, Marcelo! We stop at 2 different places to take more pictures. One is in the shade, right by a small indoor amusement park. Everyone is very friendly and curious about the solar car. One young adult man comes up to me and tells me that the solar car is the most wonderful and fascinating thing he has ever seen in his whole life! He takes lots of pictures of it and smiles broadly the whole time. Michael tries real hard to get some donations for Marcelo, but the crowd is not a generous one today. The last place is with a beautiful view of the Pacific Ocean. We all try to get some shots of the many types of boats that are cruising on the ocean behind the solar car, it is very picturesque and everyone takes a lot of pictures there. It is pretty chilly outside for the model; she is wearing a summer dress. About 4:30 PM, she is cold and tired from her long day of work, so we drive back down the boardwalk. By 4:45 PM, Marcelo has the car parked outside the entrance to the Crowne Plaza Hotel, who has given us permission to park it there for the evening. While we are closing the solar car, Michael meets a wonderful “green” group of International delegates and invites them to come back for a small presentation about the solar car right before 6 PM this evening. Michael, Rob and Marcelo decide they have just enough time for a quick dip in the hotel’s pool before the presentation. Jena decides she needs to start downloading all of her photos that were taken today, so she heads to her hotel room. I really need to make a few calls to check up on my family situation, and then go to the pool after my calls are finished. I find the three men warming themselves in the hot tub; guess the pool was too chilly, eh? Of course, I get a few pictures! At about 6:00 PM, we all head outside for the presentation to the International group. Marcelo does a great job; they are very interested and supportive. Michael asks for donations and we get very nice donations from several of them, thanks so much! After this presentation, we all go back to our hotel rooms to get ready for dinner. Marcelo decides he really must start sending out emailed thank you’s and gets busy writing and sending those out. He has a lot to do as he got over 30 business cards at the reception yesterday! He also sends a story that I wrote about him to some of his biggest supporters, this is a big compliment to me and I feel flattered, thanks Marcelo! Michael has made a new friend and wants us to meet her; he calls and invites her to dinner with us tonight. Rob and Jena are hungry, so they go to have dinner before us. While we are waiting for our new friend, Diana Williamson to join us, Marcelo finishes up all of his thank you notes. We head to dinner about 9:00 PM. Michael and I are used to having dinner much earlier, so we are very hungry! Marcelo doesn’t seem to need to eat as much as we do, eh, Michael? We have a great leisurely dinner with Rob and Jena, who have eaten their dinner already and waited patiently for us to join them. Diana arrives and joins, too. After dinner, Marcelo hears music in a different part of the restaurant, and then asks if the restaurant has dancing, they do! He suggests we all go dancing after dinner. Jena declines the offer, she must keep working on all those photographs she took today, and goes back to her hotel room. The rest of decide that dancing is a great idea and dance the night away! We all have a great time! Rob goes back to his hotel room a little before midnight, but the rest of us stay until the last song, at 1 AM! What a fun evening, after a very interesting and exciting day! We invite some new friends and the DJ and his girlfriend to come over to see the solar car after they pack up their music equipment. A few people come over and Diana and I get a chance to sit in the solar car at near 1:30 AM, I am very happy that I can fit in it and don’t feel claustrophobic when the top is lowered. Yay! I am amazed at how comfortable it is for me, I thought it would be too tight. I am so glad I got the chance to sit in the solar car, what a thrill it was! I went up to the room after this as I wanted to take a shower after all the dancing! Michael soon follows, we are very tired now, and have just realized that we will lose an hour of sleep for daylight savings time tonight, so it is really near 3:00 AM when we get to sleep. Marcelo stays outside with the solar car a bit longer, there is a wedding near where it is parked and he waits until the party is over before coming up to bed. It was a fantastic day for us all!